I am Suzanne Burke, author of Logan's Secret. Logan is my male retired racing greyhound. On December 30, 2012, Logan passed to the Rainbow Bridge. He was 12.5 years old. 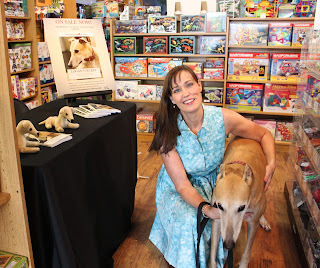 I stopped by coffee with canine to tell you about Logan's Secret and his upcoming book titled, The Mystical Collar. Oh, we definitely go for the Cafe Latte, simple, yet so elegant. Why, Logan goes for the almond biscotti with his latte. After a lengthy lost journey, at a vet's office. Logan's Secret tells of Logan's lost dog adventure. It's a story filled with adventure, adversity, impossibilities and courage. How did your your dog get his name? Any nicknames? Animal communicators we worked with during Logan's lost search told us he didn't like his retired name, "Sam". I agree he didn't like Sam after I adopted him, so I decided he should have an Irish name. I tried out several that just didn't seem to resonate with him. One morning I woke up and the name Logan came to my mind, I asked "Sam", "How about Logan?" He looked up wagged his tale and that was that. He became Logan. Does your dog do more to help or to hinder your writing? Logan is an amazing inspiration to my writing. He was with me through the entire writing of Logan's Secret. We got to experience our first television appearance together. Today, even though Logan is at the rainbow bridge, he's inspired me throughout the second book in the Logan trilogy, titled, Logan and the Mystical Collar. You will see how he comes to life as well as his other brothers who he joined at the bridge recently. Totally squirrel.... Logan and his brothers got their squirrel one day when a kamakaze squirrel was running the fence line. I don't know why the squirrel did it. I think he was taunting them and well, he made the fatal mistake of falling of the fence and the greyhounds acted in perfect pack fashion to get their squirrel. Mr. Squirrel had taunted them all season and I suppose he could outsmart them. Didn't happen. Squeaky toy - Logan wants only the best - a hedgehog squeaky! Does your dog have a favorite place to go for outings? Logan loved Main Street Grill in the Shops at Plano north of Dallas, TX. He loved sharing whatever I ordered, but most of all he loved acting like a perfect greyhound ambassador while I ate. People loved meeting Logan and he loved meeting people. Who are your dog's best pet-pals? Logan loved his brother Huston most of all. He learned quite a bit from him - how to lead with calm assertiveness. When Huston left us, Logan was a natural to take over as pack lead and he did so with dignity and grace, never forceful, always the quintessential leader. Logan's best quality was his coolness factor. He had a swagger that would make any female dog swoon. Logan would change the law of no dogs in restaurants. He so loved eating out and while he was alive, he only wished he had more choice places to test his palate. If your dog could answer only one question in English, what would you ask him? What were your favorite times on earth? If Hollywood made a movie about your life in which your dog could speak, who should voice him? I've often thought about this, and I think it would be Johnny Depp. Logan was a very cool character, sort of like James Dean and Johnny Depp has that coolness factor. 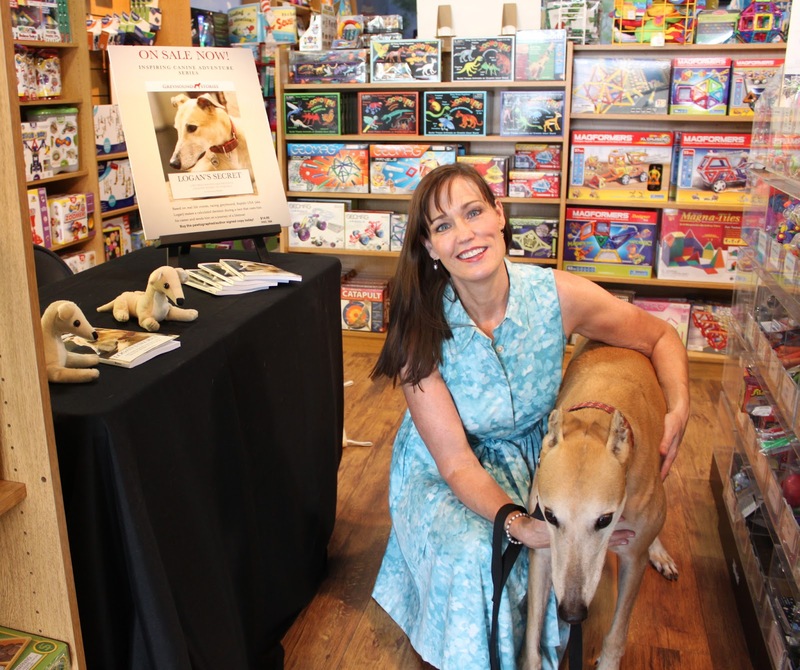 Visit the Greyhound Stories website, Facebook page, and Twitter perch. What a nice interview. Have to check out Logan's story. Thanks! Hey Marshal-can you email me at dogloverofmax@gmail.com pretty please?